And there aren’t too many things that make the house smell better than brownies – or in this case brownie bark. 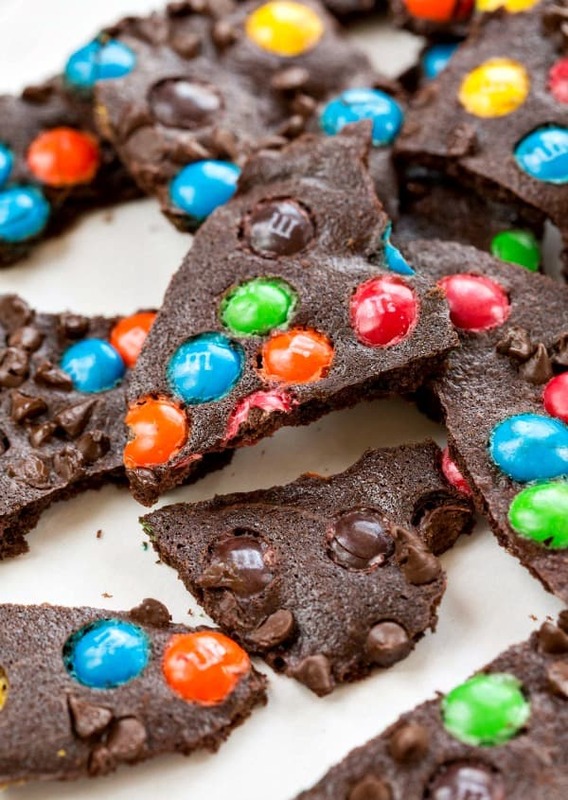 This M&M Brownie Bark recipe makes crispy, chocolaty brittle that’s full of M&Ms and mini chocolate chips. It’s totally delicious, and it’s perfect for snacking or gifting. Now, if you like things a little more on the chewy/crisp side, you can use a smaller baking sheet. 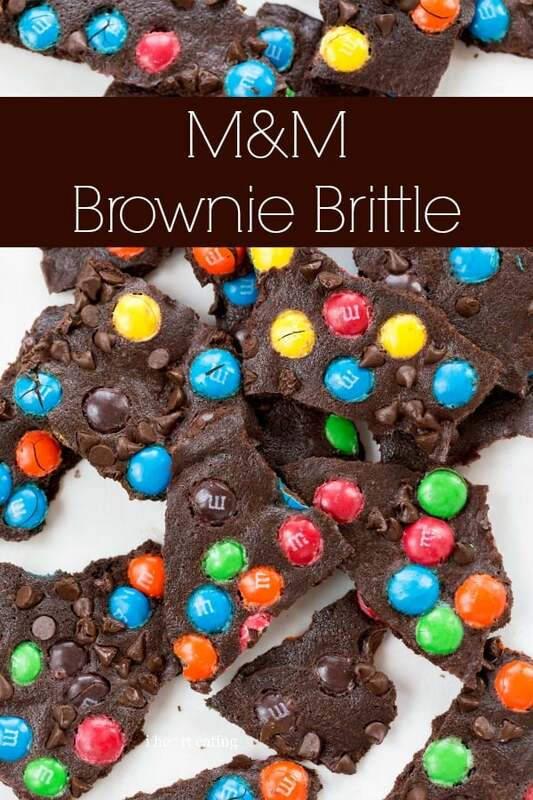 You’ll end up with a brittle that is similar to the edge of a brownie. Whether you go crispy or chewy/crisp, you’ll end up with a yummy, chocolate treat! 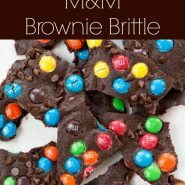 Easy way to make brownie bark at home! Preheat the oven to 350 F. Line a jelly roll pan with a piece of parchment paper or a nonstick baking mat. Whisk together the flour, cocoa powder, salt, and baking soda in a medium bowl. Set aside. In a separate medium-sized bowl, whisk together the egg whites. Add the sugars, oil, and vanilla, whisking until smooth and well-combined. Whisk in the flour mixture until just incorporated. Spread the batter in the prepared pan. You’ll want it to be spread as thin as possible. Sprinkle M&M's over the batter. Let the bark cool in the pan until it reaches room temperature. When the bark is at room temperature, break it into pieces. Wonderful recipe! This was a big hit with the gals at Bunco. Thank you! Thanks! I’m glad that it was a hit. =) Thanks for commenting! I can’t see the recipe? Help! Should be fixed now. Thanks! Delicious!!! Just made these this morning. 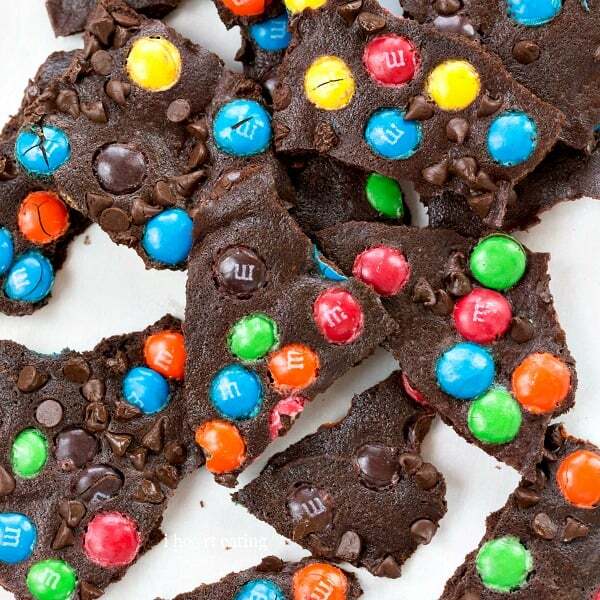 I have been struggling to find a good M & M bar cookie recipe. They always seem to be gooey on the bottom, which makes me think something doesn’t rise correctly, or that they are undercooked. BUT, not this recipe! This is so good, just like a brownie with crunchy topping. The recipe is super easy to follow and only takes a few minutes to prepare for the oven. Mine took exactly 20 minutes at 325 degrees. I have to admit we could not wait to try them and cut into the bars while they were still warm. That was a nice treat to tide us over until the rest cooled. Such rich chocolate flavor! Thank you!! They came out exactly like the photograph! Any tricks on how to know when this is done my oven is crazy and it’s hard to tell when it’s done due to the the dark color? Please and thank you? Great question! Crazy ovens make baking so difficult! My brittle is sort of shiny but doesn’t look wet when it’s done. I hope that helped! If not, please let me know!